Attack 1:  Dragonbreath (40) Flip a coin. If tails, this attack does nothing. If heads, the Defending Pokemon is now Paralyzed. 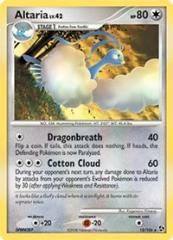 Attack 2:  Cotton Cloud (60) During your opponent's next turn, any damage done to Altaria by attacks from your opponent's Evolved Pokemon is reduced by 30 (after applying Weakness and Resistance).